This recipe is outrageous! It's like a s'more on a spoon. I was just playing around in the kitchen and made this combo and it turned out incredible. I then proceeded to fill wanton's with it and fry them and then dust them with powdered sugar....ridiculous...I know. Please do not blame me for the addiction that is about to ensue. 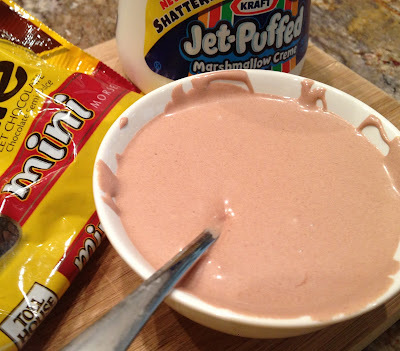 Put chocolate chips in a glass bowl and set aside. In a small sauce pan melt butter. Add marshmallow creme and milk. Stir until heated thoroughly. Remove from heat and pour over the chocolate chips in the glass bowl. Stir until chocolate chips are melted and combined well with marshmallow mix. Cover and let cool in refrigerator for an hour. Use as a dip, frosting or filling. NOTE: If using as a frosting, it is best to skip the cooling process and use it warm. This will make it easier to work with. Oh my gosh I can't wait to go to the store. How did they turn out after you fried them? I am addicted to your page. Thank you. .. They were amazing. I had trouble at first trying to fill the wontons right after making the mxiture. After I let it cool in the fridge for a while, it was way easier to use as a filling and they turned out yummy! I also used the left-overs as a dip for cinnamon/sugar graham crackers! !